Cords, electrical boxes, jack screws, and fittings of every type, corrugated tubing, and screwdrivers, pliers, terminal blocks, switches, sockets, plates and lampholders. How much equipment, tools, and material do you need to build an electrical system, repair malfunctions, or work safely on the job? Experts and technicians alike, know that when you are out on a job, you can never have enough tools and equipment, and it all needs to be right on hand to work efficiently and without risking worker safety. 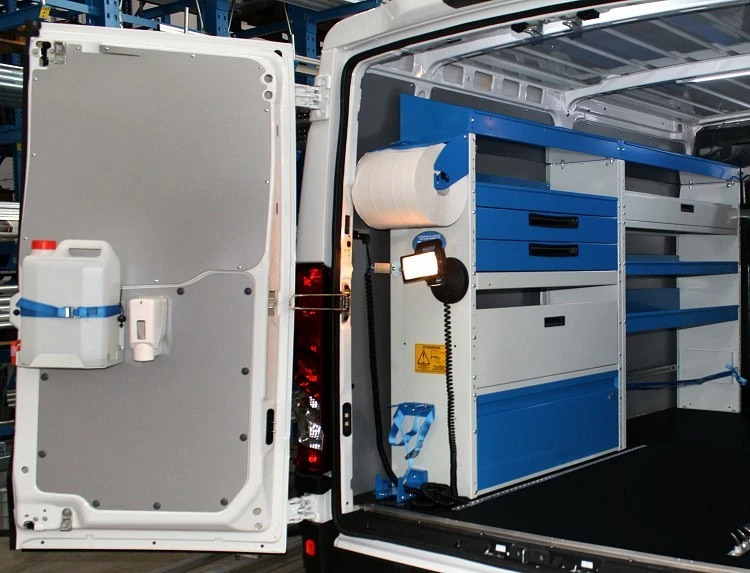 The Syncro System group, specialized in the production and installation of racking solutions and accessories for vans and commercial vehicles, offers all electrical contractors the possibility of equipping their commercial vehicle with a professional custom conversion, tailored to the model and make of the van, as well as to the particular needs of each client. 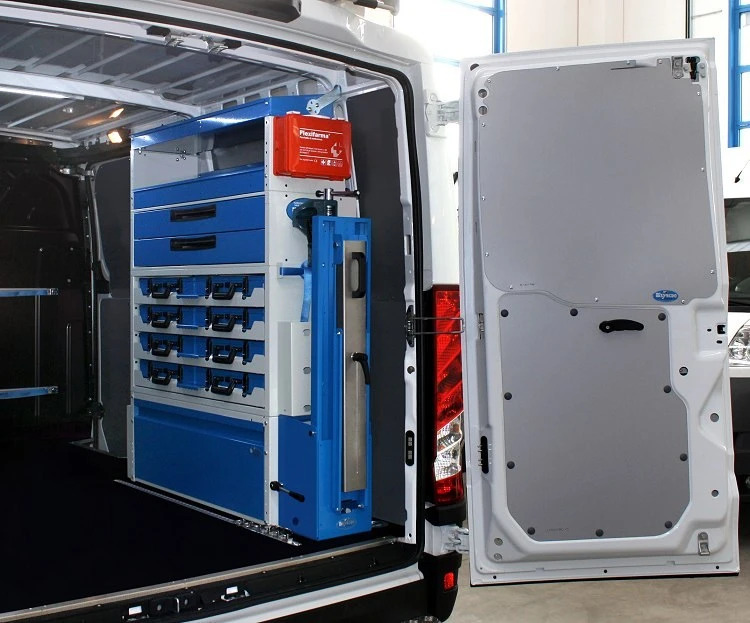 It means putting your van in the expert hands of the Syncro group who work with you to transform your van into a perfectly functional and orderly mobile workshop. 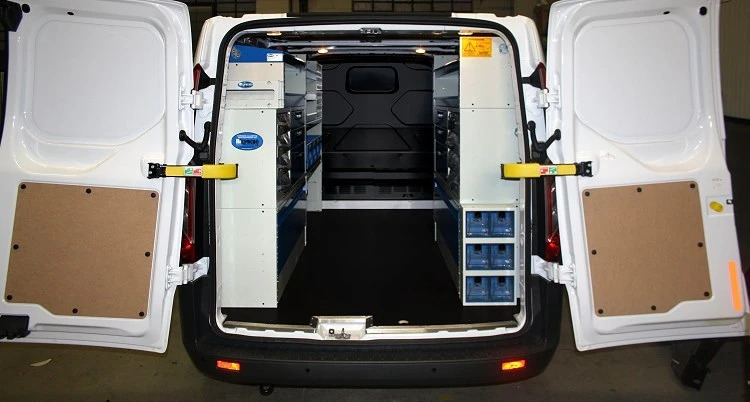 On board, you can safely store and transport all the electrical material, equipment and tools needed, as well as conveniently carry out minor jobs and repairs. If you are an electrician and you need a bit more order on board your professional vehicle, all you need to do is contact your local Syncro System center. 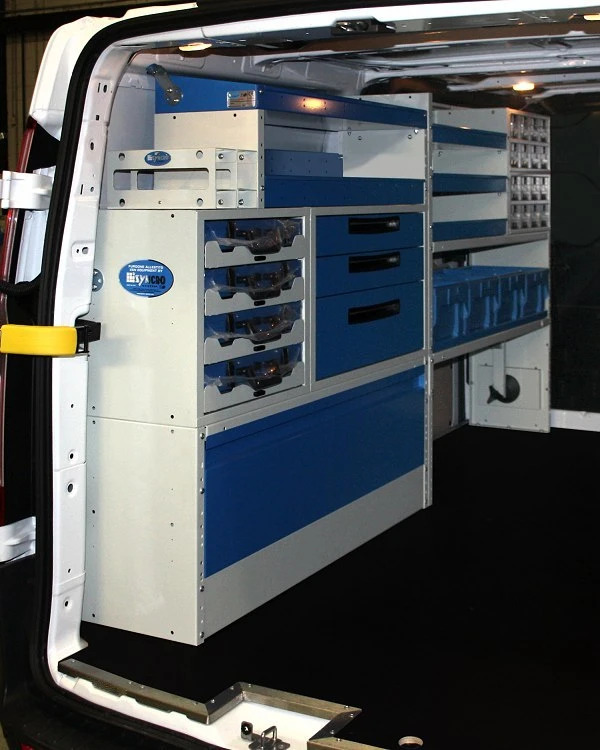 Our Syncro team will design a conversion solution just for you – tailored to your van’s model and make. The modular system allows the Syncro technicians –for more than 20 years now- to successfully install drawer units, lockers, worktops, and all types of shelving, that are not only model and make specific, but perfectly modular so that all pieces can be mixed and matched. And with Syncro’s vast array of models and sizes, it’s easy and fast to design and install the ideal combination for each of our clients. For most conversions, including those for electrical contractors, the corner stone is the interior protective paneling: galvanized steel, or plastic linings for the walls, wood or aluminum floor panels and basic racking units like drawer and shelving units and lockers. This foundation can then be built upon with targeted accessories and components, ideal for those who work in the electrical contractor sector. For example, hanging cable and extension cord holders, organizer cases, tube carriers, ladder racks, tool racks, and as you see on this Custom created for electrical work, a drawer unit with clear plastic drawers for separately storing various types of lampholders or other small parts or fittings. The larger polypropylene portable bins can transport larger equipment and materials. 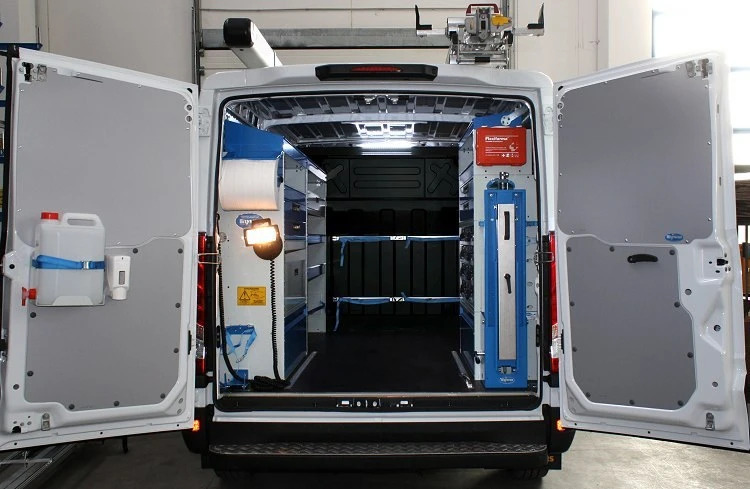 Even for this Iveco Daily, seen in the series of photos above, the transformation into an electrician’s workshop began with protecting the internal surfaces. The walls have been covered by lightweight, but durable steel paneling and the floor has been lined with a solid wooden floor panel. 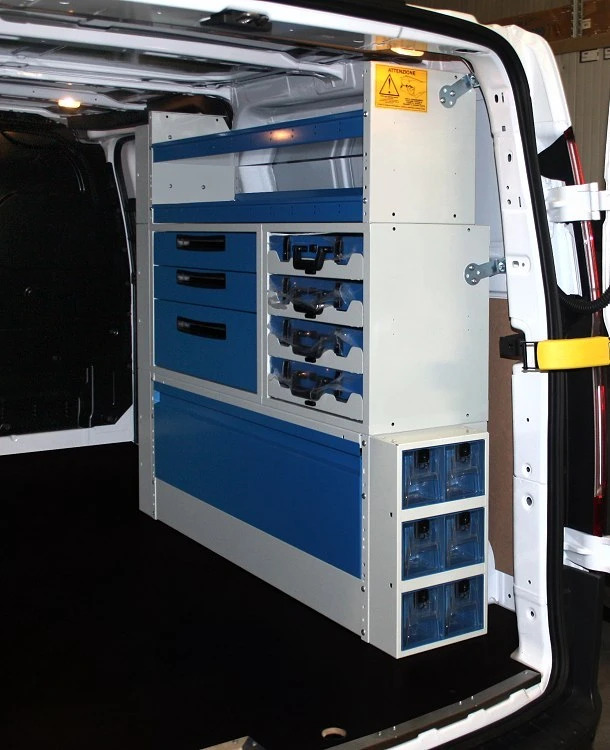 To create an optimal work space, the Syncro System team installed racking solutions on both sides of the cargo space. On the left hand side, we mounted large metal drawer units, a pull-out worktop, a storage shelf for tools, as well as some closed compartments with door panels for more fragile equipment and materials. You’ll also find an incredibly useful rotatable floodlight , that thanks to the coiled cable, can be quickly and easily positioned either inside or outside the van. 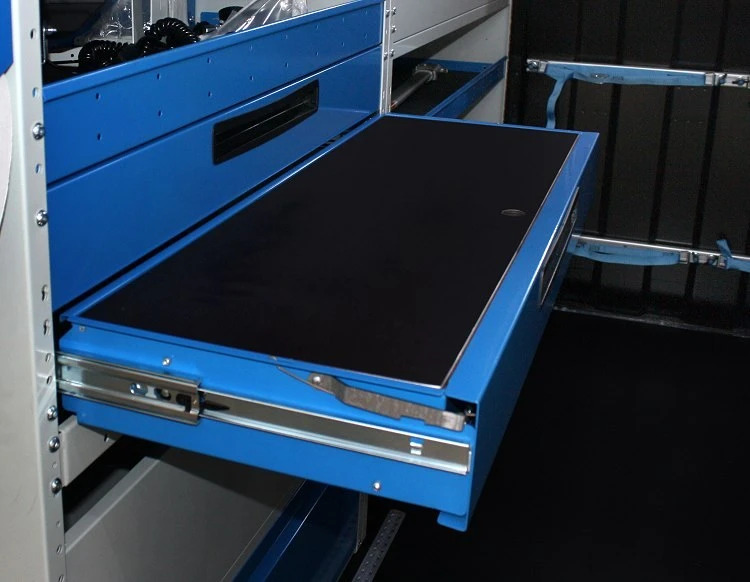 On the right-hand side, the conversion solution consists of a wheel arch base with door panel, a series of safe case storage compartments (indispensable for those who need to keep lots of small fittings and electrical material separate and organized), two large metal drawer units, and two convenient shelves – great for storing and transporting tubes and other elongated objects. To the racking units, we mounted a drop-down worktop / vise base and a first aid drawer. Along the bulkhead and on the left-hand side we also fixed straps for tying down material like pipes and coiled cables. On one of the rear doors, we mounted our soap dispenser and water tan – a veritable handwashing kit, complete with a paper towel roll holder. For electrical contractors, it is common to transport, not only lots of cables, but lots of different types of tubes too. It’s also a must to have a ladder on hand for reaching high places, ceilings, or to mount electrical boxes and plates high up on walls. 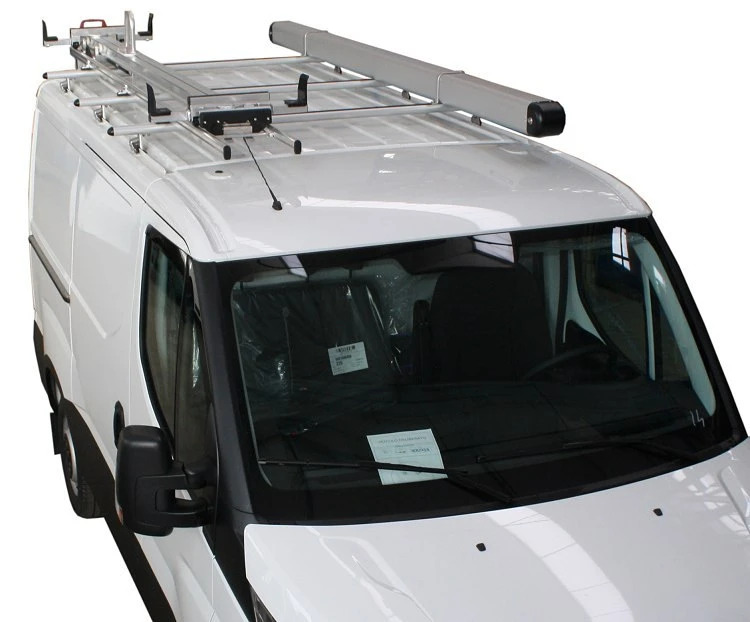 For transporting ladders and bulky or long items, the Syncro group offers its electrical contractor customers a large selection of roof racks, roof bars, tube carriers and ladder racks that are lightweight, durable and silent . The aluminum bars have been specially designed for optimum aerodynamics – reducing drag and vibrations to a minimum.